During his tenure, former U.S. Secretary of State Henry Kissinger oversaw several bloody coups and wars while earning the reputation of a war criminal. 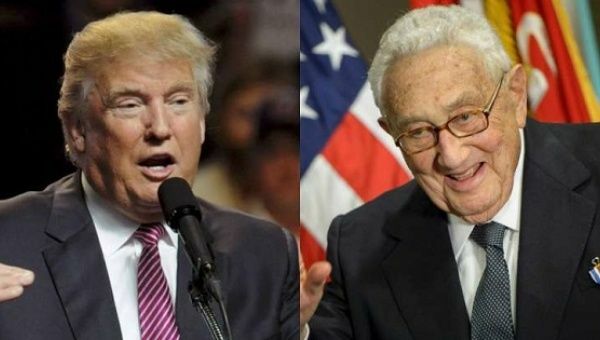 Republican presumptive presidential candidate Donald Trump met with former Secretary of State Henry Kissinger Wednesday, the GOP’s preeminent elder statesman and a controversial figure who orchestrated bloody coups and wars. The meeting was believed to be the real estate billionaire’s attempt to develop his presently unclear foreign policy. Three people close to Trump told The Washington Post Monday the face-to-face session comes after weeks of phone conversations between Trump and Kissinger. Kissinger, 92, played a crucial role in shaping U.S. foreign policy between 1969 and 1977, when the U.S. was at war in Vietnam, Cambodia and Laos, and supported the CIA-backed military coup that ousted the democratically elected socialist president of Chile, Salvador Allende. Also, documents released in 2014 revealed that in 1976, Kissinger planned to launch airstrikes against Havana, strike ports and military installations in Cuba and send Marine battalions to the U.S. Naval Base at Cuba’s Guantanamo Bay. Meeting Kissinger has become a custom for Republican candidates who are seeking the blessing of the controversial figure and the GOP. The Washington Post argued that holding this meeting “underscores not only how he is building relationships with Republican elders but how he leans toward a more realist view of international affairs, which has long been the bailiwick of Kissinger’s work.” But Trump is not the only presidential candidate seeking Kissinger’s advice and counsel. Democratic frontrunner Hillary Clinton has had a good relationship with the man. In fact, Kissinger’s legacy became a heated subject in a February Democratic debate when Bernie Sanders slammed his opponent Hillary Clinton over saying “Kissinger is a friend, and I relied on his counsel when I served as secretary of state,” in a column she wrote for The Washington Post in 2014 about Kissinger’s book “World Order”. Sanders said Kissinger’s actions in Cambodia led to a genocide and the killing of more than 3 million people. “I am proud to say that Henry Kissinger is not my friend. I will not take advice from Henry Kissinger,” he said during the debate. Trump’s foreign policy revolves around “making America great again” through making allies pay for protection, “bombing the hell out” of the Islamic State group in Syria and Iraq, while also defeating China economically. Experts have said that such comments are chaotic and unclear.